Directory Listing enables business information to be published in the National Local Directory Assistance. 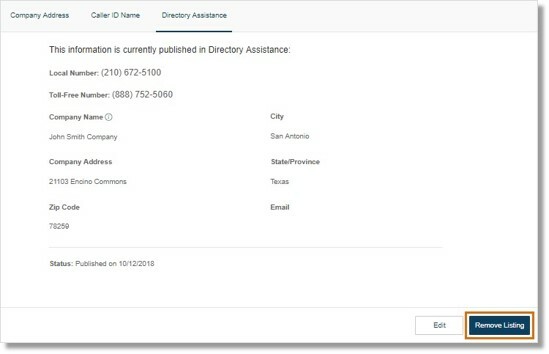 Account Administrators can remove company information from the Directory Listing via the AT&T Office@Hand Online Account. Directory Listing enables business details to be published in the National Local Directory Assistance. Once your company details are published, potential customers can readily and easily locate your business. This can be removed by Account Administrators via the AT&T Office@Hand Online Account. Log in to the AT&T Office@Hand Online Account. Go to Phone System > Company Info > Directory Assistance. Note: From the Admin Portal, you can also click Publish Company Info to Directory Assistance. See Directory Listing – Access Directory Listing | Admin | AT&T Office@Hand for more information. A confirmation window appears once your request to remove the business information has been successfully submitted. Click OK.